As a kid, there’s probably nothing that feels like flying more than swinging as high as you can possibly go, before swooping back toward the ground and up again. But because that thrill can become dangerous if a child isn’t properly secured, Lil Tikes is recalling 540,000 toddler swings due to a fall hazard. Lil Tikes announced the recall Thursday in cooperation with the U.S. Consumer Product Safety Commission, which affects more than a half million “2-in-1 SNug’n Secure” pink swings that were made between Nov. 2009 and Dec. 2013. Thus far, the company has received around 140 reports of the swing breaking, including 39 injuries to children including abrasions, bruises, cuts, and bumps to the head. Two of the reported injuries included children with a broken arm. The swings have a pink T-shaped restraint in front with a Little Tikes logo, and a seat suspended by four yellow ropes. The swings were sold at Walmart, Toys “R” Us, and other stores nationwide and online at www.littletikes.com, and other websites from Nov. 2009 through May 2014 for about $25. Check for model number 615573 molded on the back of the swing seat, as well as a manufacturing date code stamp on the back of the seat. According to the manufacturer: If the molded INNER arrow of the date code stamp points to “10”, “11”, “12” or “13”, it is included in the recall. 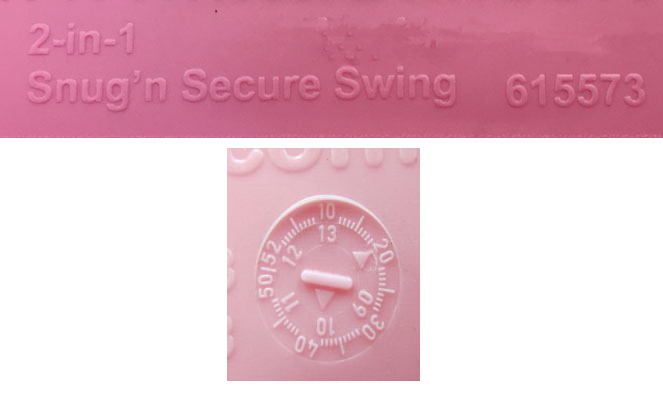 In addition, swings with a date code stamp of “9” on the INNER arrow combined with “43” or higher number stamped on the OUTER are included in this recall. No other date codes or other colored swings are affected. If you’ve got one of the recalled swings, immediately stop using it and contact Little Tikes for a refund in the form of a credit towards the purchase of another Little Tikes product. You can contact the company online through its website for the recall or at 1855-284-1903 between 8 a.m. and 8 p.m. ET Monday through Friday.